Lately I’ve noticed my iPhone 4 battery life getting worse and worse. It might be iOS 5 or it might be an aging battery. Either way, I need my phone battery to last me the whole day and my iPhone does not do that. Thankfully, I’ve been testing the PowerSkin for the past few weeks and it has worked like a charm. The PowerSkin is essentially a silicon case for the iPhone 4 with a built-in 2,000 mAh battery. PowerSkin says that it will double your battery life and we found that to be true. In the first few tests we waited for our iPhone to fully run out of battery then we would put it in the PowerSkin case. We found that it consistently charged our iPhone to at least 87% from a dead battery. We presume that it didn’t fully charge the phone because we were using the phone quite heavily while it was in the case. As with most all built-in battery cases, the PowerSkin makes the iPhone much more bulky. In fact, it almost doubles the size of the phone and can sometimes be unconfortable to carry around in your pocket. It also gets warm when being charged which can be an annoyance in the pocket. Overall, the case has a nice feel to it if you dont mind too much bulk. We found ourselves carrying the case around in our bag and using it when our battery would get low. 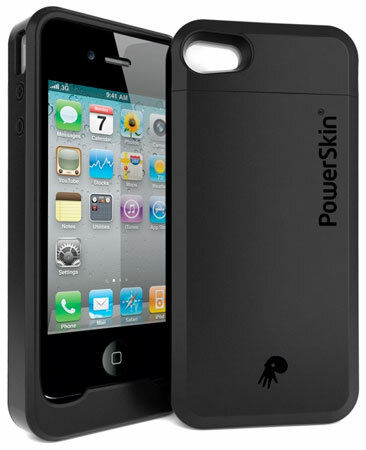 The PowerSkin for the iPhone 4 is going to run you $80 and is available on PowerSkin’s website.